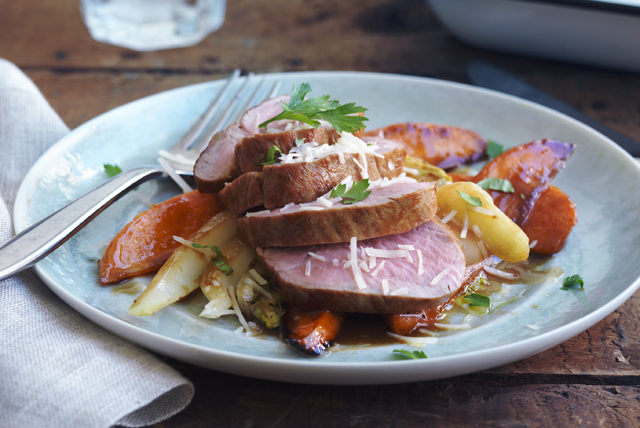 This easy-to-make foil-pack recipe uses fig balsamic dressing to both marinate the pork tenderloin and flavour the sweet potatoes. And since both are grilled in foil packs, cleanup is a snap! Mix 1/4 cup dressing and ginger until blended; pour over meat in shallow dish. Turn to evenly coat meat. Refrigerate 30 min. to marinate, turning meat occasionally. Meanwhile, toss vegetables with remaining dressing; spoon onto large sheet of heavy-duty foil. Fold to make packet. Heat barbecue to medium-high heat. Remove meat from marinade; discard marinade. Place meat on second large sheet of heavy-duty foil; fold to make second packet. Grill both packets 15 to 18 min. or until meat is done (160ºF) and vegetables are crisp-tender. Cut slits in foil to release steam before opening packets. Sprinkle vegetables with Parmesan. Slice meat. Serve with vegetables. Prepare using Kraft Sun-Dried Tomato & Oregano Dressing.